George “SEN-1” Morillo is a graffiti legend. An original member of the IBM Crew (Incredible Bombing Masters), he became famous in the 1980s for his graffiti art on NYC subway trains. Today, SEN-1 continues to have international influence, and has received commissions from such notable figures as former First Lady Michelle Obama and musicians Fabolous and Rita Ora. 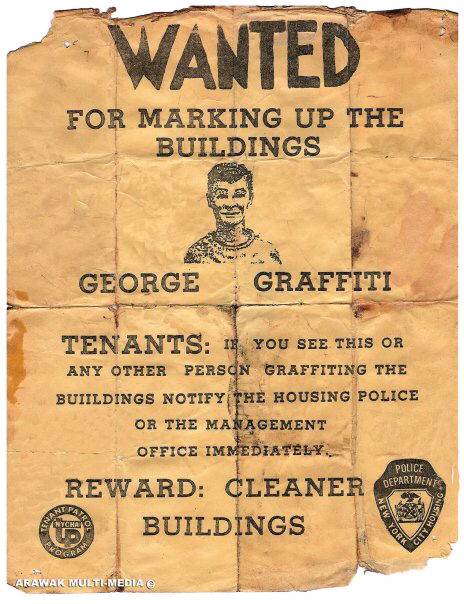 George's life as an artist began at the age of 12, when he and his crew "graffiti bombed" buildings and NYC subway trains. It was the 1980s, and having been excluded from the Joan of Arc school in Manhattan, George created a career out of his childhood art. He continues to paint public artwork today. Originating in the New York City subways, graffiti was for a long time regarded by the city’s authorities as an act of vandalism. Along with other young dreamers in the early Hip-Hop movement, George felt a strong desire to represent himself and his community in the face of poverty, oppression, and often, death. Leaving his "SEN-1" tag large and proud around the city was a playful way for George to develop his artistic skills and create a legacy along with his infamous IBM crew. SEN-1 became well known for his artful dialogue with other graff writers on the Number 1 train and was ‘WANTED’ for marking up neighborhood buildings with spray paint. Mayor Koch’s zero-tolerance policy, and the Reaganomics of the late 80s, ended the era of subway train graffiti, but not before SEN-1 had gained global recognition as a Master of Graffiti and Hip-Hop revolutionary. Despite his fame, George's artistic career took a backseat to the challenges of daily life as a young, afro-Caribbean adult raising a family on the Upper West Side in the 90s. During this time, George became active in the Black Panther Collective. Having lived through the gun and crack epidemic of the 80s and 90s, George chose to serve his community and developed after-school programs for young people, and created newsletters to educate his peers about the civil and constitutional rights of Americans. I don’t just throw paint around in the name of ‘Art’. Having seen many friends and members of his community die at the hands of the police, George pioneered a peaceful, anti-brutality program for the Panthers. He defined the program’s non-violent tactics, and had patrols exchanging their 9mm guns for 8mm cameras. This strategy was so successful that it was adopted elsewhere in the country and later developed into ‘Cop Watch,’ which still exists today. Still highly respected for his masterful, public artwork, SEN-1 continued to work on private art commissions. In 2009, his work attracted the attention of fashion designer Rachel Roy. SEN-1 provided patterns for four of Rachel’s collections, and in 2009 his artwork was commissioned for 7 of MACY’S main avenue windows in New York City. SEN-1’s has received commissions from Time Out New York, and from such notable figures as former First Lady Michelle Obama, and musicians Fabolous and Rita Ora. From a New York City graffiti outlaw to fine artist, SEN-1's work can still be enjoyed in public as street art murals or on canvas hanging beside master works in the world's finest private galleries.